Background: Aging is a complex process accompanied with the decline of the different physiological functions. Numerous differentially expressed genes (DEGs) have been found in the aging brain of senescence-accelerated mouse P8 (SAMP8), however, it was challenging to screen out the crucial ones. Objective: This study aimed to explore the crucial genes and pathways in aging brain of SAMP8 mice, which would be beneficial for understanding the pathogenesis of brain aging. Methods: Firstly, 430 genes that are differentially expressed in SAMP8 mice versus SAMR1 mice were obtained from 9 gene expression studies, and gene-gene network was constructed. Clustering analysis and topological analysis were used to single out the hub genes from this network. 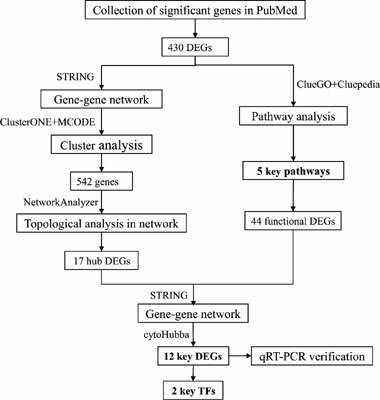 Secondly, pathway enrichment analysis was utilized to identify the key pathways from the 430 DEGs, and the DEGs in key pathways were considered as functional genes. Thirdly, the inner-network between hub genes and functional genes was constructed, and the key genes were predicted. Parts of the key genes were experimentally verified by quantitative real-time PCR (qRT-PCR), and the associated transcription factors (TFs) were predicted. Results: Our results revealed that 12 crucial genes might affect brain aging, including Trp53, Bcl2, Tnf, Casp9, Fos, Il6, Ptgs2, Il1b, Bdnf, Cdkn1a, Pik3c3, Rps6ka1, among which Casp9, Fos, Ptgs2, Cdkn1a, Pik3c3, and Rps6ka1 had been verified by qRT-PCR in 10-moth-old SAMP8 mice. Five functional groups including mitogen-activated protein kinase (MAPK) signaling pathway, neurotrophin signaling pathway, Hepatitis B, Alzheimer's disease and Oxytocin signaling pathway were significantly changed during aging process in SAMP8 mice. Two key transcription factors of c-Fos and C/EBPbeta were predicted by constructing a TF-target gene network. Conclusion: These putative genes and pathways are closely related to brain senescence and our results would gain new insight into the pathogenesis of brain aging. SAMP8, aging, network, gene, pathway, bioinformatic.